Welcome to Myrtle Press Printmaking Studios. Open to the public for classes and by appointment. Through workshops, classes, visiting artists and exhibits we provide opportunities for the community to learn about and explore printmaking. Relief, intaglio, monotype, silkscreen, lithography, and solar plate printing are accessible through our facilities. Subscribe to our newsletter and see what we are up to here. 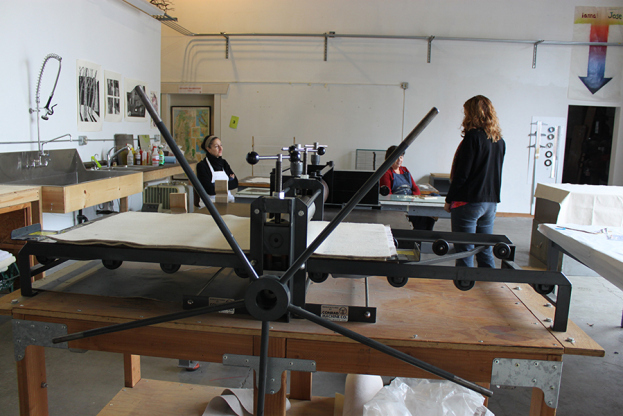 We offer membership to artists and others interested in a collaborative printmaking work space. Please join us on an hourly, daily or monthly basis. (We are located on the alley at the back of the Verge Center for the Arts building).